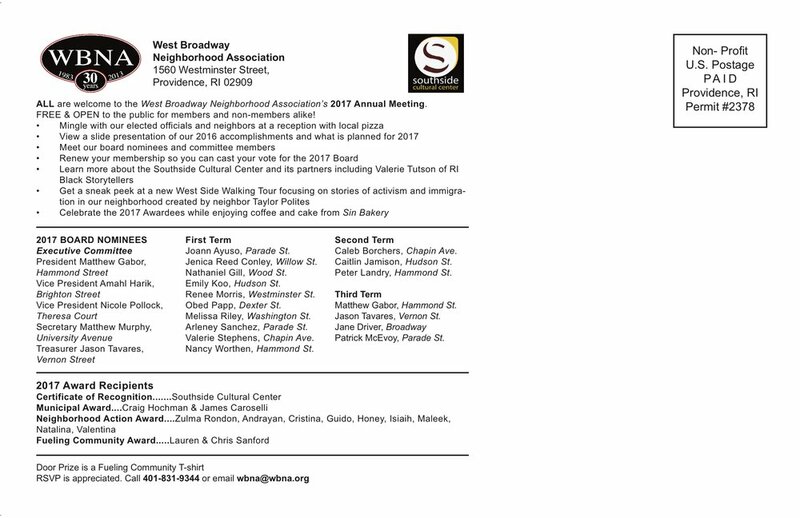 Please join us for our Annual Meeting held this year at the Southside Cultural Center, an exciting and storied "cultural hub" at Trinity Square on Broad Street, where the Upper South Side, West End, and Downtown neighborhoods of Providence connect. The WBNA Annual Meeting is traditionally an inspiring mix of celebration, anticipation and exploration. This year we launch a new initiative called One West Side which will focus on issues of inclusiveness and equity in the neighborhood with the explicit aim to reach, connect with, and represent all of our neighbors. The evening starts at 5:30pm with an informal reception with elected officials and neighbors. Enjoy pizza courtesy of local restaurants while meeting new neighbors and catching up with old friends. At 6pm our program begins. We'll learn about our host location, the Southside Cultural Center, from SCC's Executive Director Richardson Ogidan and Peter Bortolotti, Chairman of the SCC's Board of Directors. And we'll hear from Valerie Tutson of Rhode Island Black Storytellers, one of SCC's resident partners. 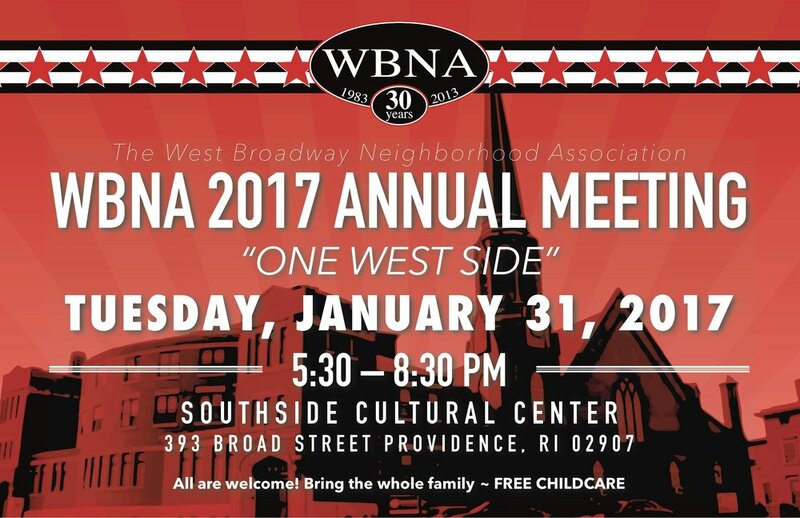 We'll see a presentation and slide show of what WBNA has accomplished with neighbors in 2016 and what's planned for 2017. And we'll get a sneak peek of a new West Side Walking Tour focusing on stories of activism and immigration created and researched by neighbor and author Taylor Polites. The evening also includes an awards ceremony that honors those who have gone above and beyond to support the WBNA's mission, and a welcome to our new WBNA board members which comprise our most diverse Board of Directors to date. Celebrate these neighbors with coffee from White Electric and cake from Sin Bakery after the program. The Annual Meeting is FREE and OPEN to the public and welcomes members and non-members alike. Families welcome, too, as we offer free child care. We hope to see you there!